1971-72 O-Pee-Chee Hockey is considered by many to have one of the best designs of all-time. It has a simple look that reflects the era in which it was released. Card fronts have a player picture superimposed in front of a solid-colored background that is inseted into a circular frame. The team name appears in a wild, curved font where the letters get larger on either end. Below the picture is a team logo, the player's name and position. For the first time, the backs differ from the format used in the same year's Topps set. They are laid out horizontally and broken into two parts. The left block features a complete year-by-year statistical record. A short biography in English is in a box above the stats, and a French translation of that biography appears in a box below it. The right side starts with a black box that contains the player's name, team and position as well as a card number. A cartoon about the player appears below that, followed by his vital stats. Cards 245 through 249 feature the players who won various awards during the previous season. All-Star players appear on cards 250 through 261. Gordie Howe and Jean Beliveau have cards that commemorate their retirements. 1971-72 O-Pee-Chee Hockey also has two checklists. 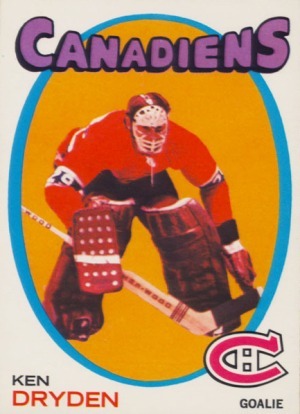 The key 1971-72 O-Pee-Chee Hockey rookie cards feature Ken Dryden, Guy Lafleur and Marcel Dionne. Other notable rookies include Butch Goring, Reggie Leach, Richard Martin and Rick MacLeish. 71-72 OPC BOBBY ORR "1st All-star Team * # 251 Very Nice Card!!! Best set ever! I enjoy collecting this set. So cool. Not easy, for sure.